well, Rum & Raisin is my latest craze. I had planned a rum & raisin ice-cream today. since the ice-cream plan had to be delayed, i sneaked in some of that combination in the buckle. it worked really well. I used Angostura Trinida & Tobago Caribbean rum (aged 7 years) in the recipe. but i guess any dark rum will work. the pears poached in rum taste great by itself. in case you haven't tried the combination you should cook up some right away. you'll thank me for the recommendation ! In case fruit buckles are new to you too... here is what they are. They are a type of cake in which fruits are added to the batter and are topped with a struesel. now why are they called buckles ? well because, as the cake bakes, it tends to "buckle" around the fruits. 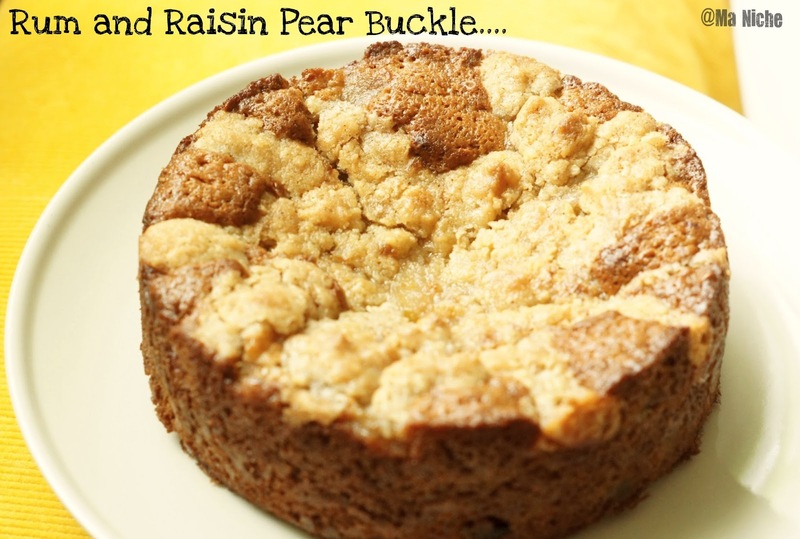 i also gathered that originally blueberries were the star-fruits used to bake buckles... but as it turned out, rum-poached pears also taste wonderful nestled in the cake ! first i melted the butter in a saucepan, stirred in the sugar and added the pears. immediately afterwards i added the remaining ingredients to the saucepan and let the sliced pears poach in the liquid for 5 minutes. then switching off the heat i left the raisins in the liquid until they had plumped up a bit, about 30-45 minutes. for the struesel, i simply hand-mixed all the ingredients together and kept it aside. first i preheated the oven to 375 degrees F, lined a 6 inch springfoam pan with a parchment paper, then sifted the flour, salt and baking soda together and set it aside. next using the hand mixer i whipped the sugar with the butter until the mixture looked creamy. then added the evaporated milk and sour cream to the butter-sugar mixture and whisked till the mixture was well-combined. i then stirred the sifted flour-mixture to the butter mixture with a light hand until the flour got incorporated into the batter. then adding the soaked raisins in the batter, i poured it into the prepared springform pan, arranged the rum-poached pears on top of the batter in a circular pattern, spread the struesel on top of the pear and transferred the pan into the preheated oven and baked for 45-50 minutes, until a skewer inserted came out clean. Wow, rum and raisin sounds delish! I love rum and raisin, especially rum in bakes! Your buckle looks lovely! It is nice having you bake along with us! Hope you can join us again! Hi Tanu, that's a very lovely cake. Love the streusel topping, awesome. Thanks for sharing your recipe. What a lovely looking dessert. I love Rum Raisin anything and your buckle sounds delicious! Thank you for sharing your recipe with the Hearth and Soul hop. Yours has extra steps but looks so totally worth it! 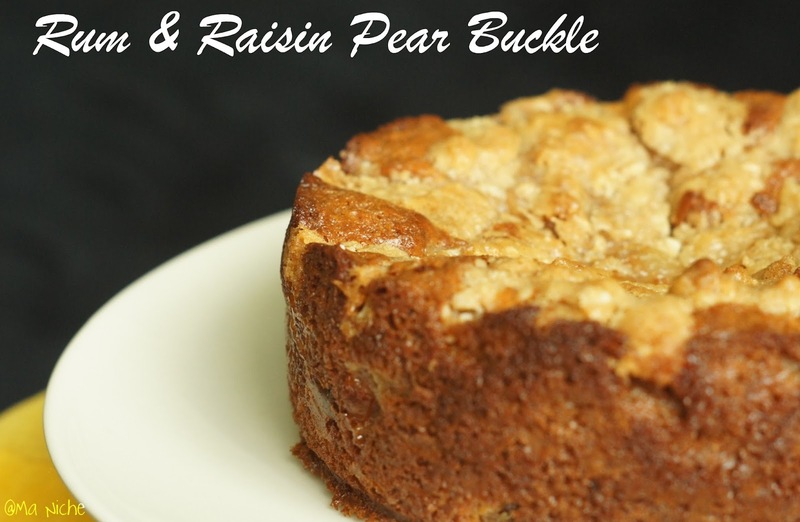 Your Run and Raisin Pear Buckle looks delicious, we would sure enjoy it. Thank you so much for sharing with Full Plate Thursday and have a great week! Nice to have you baking along with us! Love your boozy version of fruit buckle. 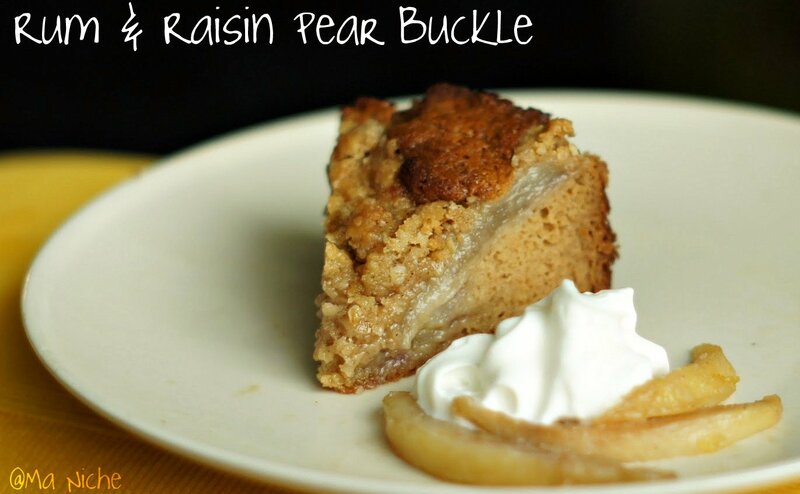 What a delicious idea to use rum-poached pear to make your fruit buckle. You are so clever incorporating 3 good recipes into 1. Sounds absolutely delicious. The flavors are tempting. I still have to make mine but right now, I am out of fruit. Thanks for sharing this on My Meatless Mondays. It makes a great dessert. I love Buckles. Yours sounds delicious. Visiting from Marvellous Monday's. hi, nice to know you thru bake along! 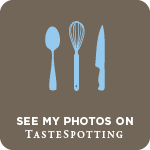 this is a good inspiration and idea besides the usual blueberries buckle and a boozy one, i know i will enjoy it very much!thanks very much for baking along with us and hope to see you around! 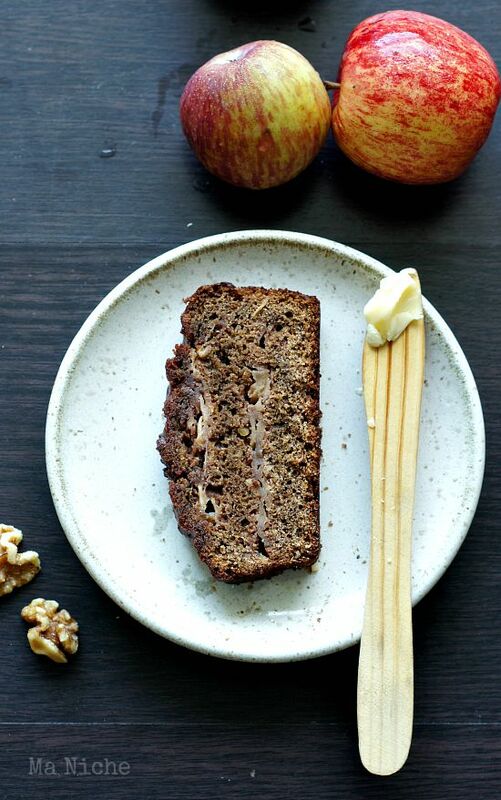 Delicious buckle Tina. I love it, Admire you for lot of baking. Thanks for sharing with Hearth and Soul blog hop. Beautiful looking cake and sounds DELICIOUS ! !